Farata Systems specializes in development of enterprise Web applications. 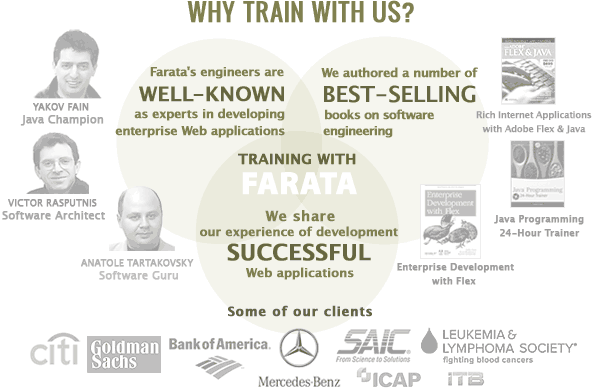 Farata Systems offers a unique combination of software engineering with real-life expertise. We don't just teach RIA development. We share our experience gained while working on the real-world projects. Modern UI focus is mainly on function: how well it performs its functions and how easily those functions are accessed. Farata Systems created open source framework for Flex developers - Clear Toolkit. We build applications. Every app is unique. We create it. You own it. that’s not just a trend. and be prepared for a mobile-first world. that substantially increases productivity of enterprise developers. swc file that includes a number of enhanced Flex components like Datagrid, ComboBox et al. Training At Farata: YouTube Chanel. Learn how to build and deploy Web applications. Books authored by Farata’s software engineers and selected technical articles. Some presentations created by Farata’s software engineers.